We heard that Esther Gray, the name synonymous with the University Lecture Series, will retire this year. Thanks again Esther for getting us interview with icons such as August Wilson and Dr. Neil deGrasse Tyson. 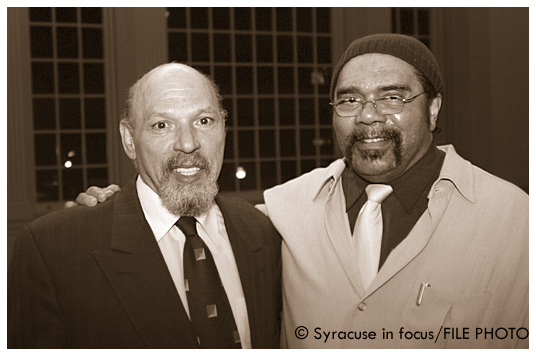 August Wilson (left) with Bill Roland during Wilson’s visit to Syracuse University in 2003. American Masters on PBS will be airing a program about August Wilson tomorrow. Wilson wrote 10 masterpieces (aka plays) about each decade of a 20th Century Pittsburgh neighborhood called the Hill District. We were fortunate to meet him during his visit to Syracuse, and he was very generous with his time and shared his work process. Here is a Q+A session about Wilson in NYC that gets to the essence of his genius. And speaking of throwbacks, special shout out also to Frank Vick for helping us develop an audacious appreciation for theater back in the day. Syracuse Stage Producing Artistic Director Timothy Bond talks about the impact of writer August Wilson, specifically Two Trains Running, which is playing this month at the theater. Syracuse Stage has run seven of Wilson’s ten plays that chronicle African American life in each decade of the 20th Century. When it comes to an accurate portrait of African American life, site August Wilson’s cycle of plays examining the 20th century is a gift that keeps on giving. This month Syracuse Stage produced Wilson’s Radio Golf. Radio, set in 1990s Pittsburgh, revolves around Harmond Wilks (played by Richard Brooks) as he attempts to redevelop a blighted Pittsburgh neighborhood and parlay that venture into a run for mayor. At the climax of the play the audience is left with a sense that change is coming, but not without a struggle, or a fight. A “Talk Back” forum was held by the stage and the actors talked about the genius of Wilson and how his work always fosters further examination. Leland Gantt (Radio’s Sterling) said that the actors were on a journey to excavate the truth in Wilson’s work (the last he produced before he passed in 2005). Thomas Jefferson Byrd (Radio’s Elder Joseph Barlow), who appeared in Wilson’s Ma Rainey’s Black Bottom at Syracuse Stage in 2009, described interpreting Wilson’s work on stage like eavesdropping on a conversation or peering thru a peephole at a family discussion. He said Wilson was able to avoid stereotypes by being true to the characters. “You know the truth when you hear it,” he said. 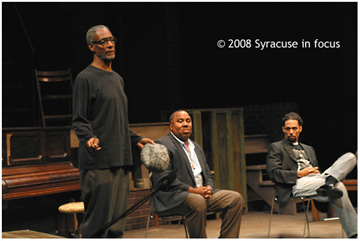 Syracuse Stage Producing Artistic Director Timothy Bond began a series of discussions around the August Wilson play Ma Rainey’s Black Bottom, which opened the season. On September 21, I attended a post show forum on the use of the N-word during the play. The forum featured Actor Thomas Jefferson Byrd (standing) along with media personality George Kilpatrick (center) and professor Dr. Adam Banks. Byrd told the crowd of about 50 that he was not offended by the use of the N-word during the play because it was part of the dialogue that showed a true portrait of the world of the featured characters (circa 1920s). Wilson’s work gave those characters, and their world, recognition and worth, Byrd said. Banks added that the word as well as the use of the N-word must be framed within the proper historical and cultural context.